Americans are paying more for prescription drugs than ever before. Without prescription coverage, staying healthy can come at a high price. The Atlantic County Prescription Discount Card provided to you in a joint effort with the National Association of Counties (NACo), can save you money on many of your prescription purchases. Any county resident without prescription coverage can use this program. If you have insurance for prescription drugs, you may still benefit from the discount card, since it may save you money on prescription drugs your existing plan does not cover. Valuable. Save an average of 24% off the pharmacy’s regular price on all commonly prescribed prescriptions and an average savings of 50% on 90-day supplies of select generics through mail service. Savings are also available on high-tech and injectable drugs through the Caremark specialty pharmacy. Convenient. There are more than 59,000 participating pharmacies nationwide, over 50 are located right here in the county! The MyCountyCares Dental Plan can save participating members on savings of up to 60% on most dental procedures including routine oral exams, dentures, root canals, crowns and more. 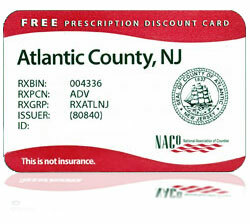 Click here to print your FREE Atlantic County Prescription Discount Card and start saving today!